VI Warshawski's latest case has already opened up old wounds. But when a silky voice on the phone threatened to throw acid in her eyes, VI knew this one could finish her off with some brand-new ones. The sour-faced old aunt she had agreed to help was accused of stealing millions in stock certificates from a pious order of Dominican brothers. VI knew the woman was a witch, not a thief, and she soon smelled something rotten in the sanctum sanctorum of Chicago's most powerful movers and shakers - the Church and the Mob. Now someone wants to see VI burn in hell. But this tough cookie of a private eye had her back up, a brand-new Smith & Wesson, and a daring plan to make the bad guys go to the devil first. It's easy to forget, in the current decade, just how groundbreaking Sara Paretsky's novels starring tough private eye VI Warshawski were when they first hit the crime scene in the early 1980s. Thirty-five years ago, female protagonists in crime weren't anywhere near as common; the most famous were the likes of elderly amateur sleuth Miss Marple, who relied on her shrewd intelligence and observation skills to solve crimes in her English village, and young amateur sleuth Nancy Drew, a well-off, multi-talented, and attractive teen who likewise relied on her smarts to outwit criminals (as she solved mysteries in among her travels and other privileged teen adventures). VI Warshawski was something completely different. A female version of the hard-boiled private eye made famous by Raymond Chandler, Dashiell Hammett, and Ross Macdonald. VI is smart, but can also handle physical confrontations, uses a gun, and is comfortable delving into the sludge of society. She is a gritty, complex character that happened to be a woman, and she transformed crime fiction. Put simply, Warshawski is a fantastic creation, and it's easy to see how she went on to provide the spine of an award-winning series that's run for more than three decades. In KILLING ORDERS, the third of eighteen Warshawksi novels so far (along with several other stories), VI is pulled into a case when her hated aunt gets in trouble. Family loyalty and past promises outweigh the enmity Warshawski feels But as she investigates what seems a violence-free crime, lives are in danger. Warshawski is threatened with acid, people she cares about are hurt, and worse. It was just stock certificates - what is going on? Paretsky weaves a very fine crime novel that still holds up three decades later. It's fascinating to delve back into the early days of Warshawski, pre-smartphones and computer ubiquity, where private eyes burned shoe leather and had to use lock picks and other tactics to gather hidden information. There's a really strong sense of Chicago in KILLING ORDERS, and plenty of questions raised about the use and abuse of power by various organisations. Long before Dan Brown and real-life scandals had people regularly questioning the untouchable status of the Church, Warshawski takes on its power and Paretsky explores some of the things that can go right, and wrong, within its sanctified walls. It's an action-packed tale where Warshawski gives as good as she gets, getting into and out of some amazing, hair-raising scrapes that teeter along the suspension-of-disbelief tightrope. But never tumble. Paretsky is a very fine writer who crafts entertaining stories centred on a great character. Together she and Warshawski shook up the crime fiction world, attaining iconic status. 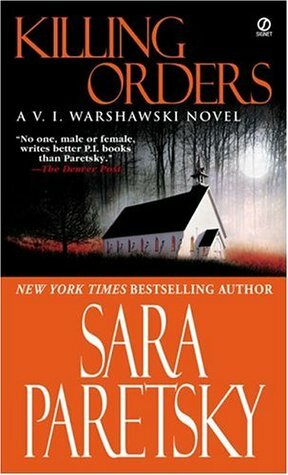 Sometimes it can be easy to forget that books like KILLING ORDERS are just damned good reads, too.